I was saddened to hear of the death of restaurateur and TV presenter Keith Floyd last week. He didn’t strike me as a man whose time was up just yet. He was irreverent and politically incorrect, but I enjoyed watching him. He didn’t pay much heed to recipes, cooked by instinct and enjoyed life to the full. At a time when that was unfashionable he championed local food – wherever local might be at the time – and introduced me (on TV only, unfortunately) to a very young, but already spiky-haired Gary Rhodes and the revival of traditional English food. I’ve no idea where the Just and Glorious have sent him, but I hope it’s somewhere with lots of good food, good wine and good fun … Keith Floyd deserves it. Another astonishing bit of news this month is the discovery of a vast hoard of Anglo-Saxon treasure. Someone with a metal detector got lucky in a field in Staffordshire … and the rest of us got lucky because we got a glimpse into the past. The collection of jumbled pieces of precious metal – knife hilts, shield bosses and arm rings amongst them – gives us a little indication what life was like for a warrior at a time when spoils and loot were the standard payment for services rendered. And it doesn’t seem so different to the life of Uthred, described by Bernard Cornwell in his very enjoyable Anglo-Saxon Chronicles. I haven’t had too much time to spend on the site this month as I’m preparing to teach a course at our local college while struggling with the long overdue decorating, but I’ve tidied up the Christmas recipes and added a bit of a survival guide for busy foodies. There you can find some of the tastiest shortcuts for a traditional English Christmas dinner … just in case you run out of time. Bradt Travel Guides have just published a new book that’s guaranteed to be a Christmas favourite with dads and grandads – and quite a few mums I know! 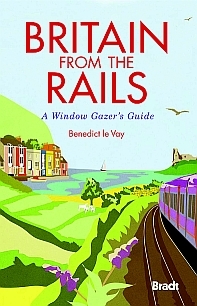 Britain from the Rails – a Window Gazer’s Guide is for anyone who enjoys travelling by train. It covers some of Britain’s (not just England’s) most scenic routes and I’m sure you’ll enjoy Benedict le Vay’s writing as much as the views. Bradt Travel Guides offer 25% off to all Essentially England newsletter subscribers. Just enter EE25 in the coupon code box when ordering. Christmas shopping with its crowds and chaos is my idea of horror, so I’m eternally grateful that someone’s invented the internet. If you like to go away for Christmas, but don’t want the chaos of crowded airports, then you might like to check out English Country Cottages. Renting a cottage somewhere pretty over the holidays makes a real change and there are some terrific deals out there at the moment. After September, things start to wind down a little. But if you love English history, then one very serious event is coming up. October 14th is King Harold Day … the day of the Battle of Hastings, when Anglo-Saxon England changed, brutally and comprehensively, into Norman England. Ripe elderberries remind me that it’s September, just as English marmalade tells me that it’s February. Pick a few large heads of elderberries – maybe 500g / 1lb or so - and wash them carefully. Snip off the largest stalks and place the berries in a large saucepan. Just cover with water and bring to the boil. Simmer for 10-15 minutes. The berries will burst and mush and the water will turn an amazing shade of purple. Now strain the liquid through a fine sieve into a clean pan. You should end up with about a 1 – 1.5 litres of juice. It will be rather tart. Heat the juice and add sugar to taste. When the soup’s at boiling point thicken lightly with cornstarch or arrowroot. You want a deep purple, velvety finish. Whip some cream with a little sugar until stiff. Serve your elderberry soup in deep white plates or bowls to show off the colour, floating dollops of whipped cream on top. Shortbread goes nicely alongside as do – strangely enough – plain rusks. We’re having friends from Germany to stay, so some exploration is on the cards. Cheddar Gorge is on the list, as are Avebury, Chedworth, Glastonbury and Wells … hope the weather will play ball.